Dead­ly Occu­pa­tion is a just-pub­lished pre­quel to the oth­er Michael Stod­dard his­toric mys­ter­ies. Lieu­tenant Stod­dard is a British offi­cer sta­tioned in the Amer­i­can colonies dur­ing the Rev­o­lu­tion. As such, one might not think him a hero to a 2015 Amer­i­can read­er, but that is not a con­cern for this Amer­i­can read­er. I have read the oth­er mys­ter­ies in this series, and while I rec­og­nize char­ac­ters from those, this book gives back­grounds of char­ac­ters with­out spoil­ing or reveal­ing any­thing from oth­er books. The Stod­dard books bring out the ambi­gu­i­ty in Amer­i­ca at that time. There were Amer­i­cans who pre­ferred British rule as well as those who didn’t. (And there were nas­ties on each side, one revealed for sure.) Dead­ly Occu­pa­tion also illus­trates the ambi­gu­i­ties of his­to­ri­ans, for Suzanne Adair has delved into his­to­ry that is sel­dom report­ed. Makes for a (excuse me) damn good read! Oth­er read­ers agree. Here’s a bit from one Ama­zon five-star review: “Michael Stod­dard is a young, 27-year-old, Lieu­tenant with a gift for solv­ing crimes, a chin full of blem­ish­es, and a murky past. In this nov­el, he choos­es an assis­tant, 18-year-old Nick Spry. Spry has his own tal­ents, an eye for detail and a relaxed way with peo­ple that encour­ages them to open up to him. He’s young, but he’s no one’s fool. They are an unlike­ly pair, yet they get results. 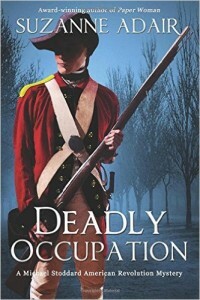 I can’t believe I haven’t already pro­filed this book on my Mon­day book blog. It’s one of my very favorites—not only mys­tery, but his­to­ry as well! My com­ments from Ama­zon and Goodreads fol­low. Suzanne Adair has pre­sent­ed the read­ing pub­lic with anoth­er excel­lent his­toric mys­tery adven­ture. This book is Michael Stoddard’s sto­ry. He’s a British offi­cer in Amer­i­ca at the time of our Rev­o­lu­tion. The ear­li­er books in this series tell the sto­ries of Amer­i­cans dur­ing that time, and a few of the char­ac­ters appear in all of the books. They, and this one as well, show the con­flict­ing loy­al­ties of peo­ple in our past, includ­ing the Eng­lish Michael. Besides that, there’s the main sto­ry of a miss­ing young boy and how Michael and his sec­ond in com­mand worked toward find­ing the boy while also fol­low­ing their com­mand­ing officer’s orders. I won’t say more, don’t want to ruin the sto­ry for any­one. High­ly rec­om­mend­ed to lovers of his­to­ry, and mys­tery. This book sat­is­fies on every lev­el! It’s a mys­tery with great char­ac­ters, sol­id his­to­ry, sus­pense, and emo­tion. 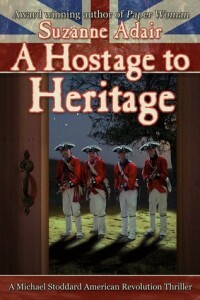 It’s his­tor­i­cal fic­tion with reveal­ing atti­tudes and war-time dan­ger. It’s a char­ac­ter study with “real” fic­tion­al peo­ple who had a past and will have a future. It’s roman­tic sus­pense with antic­i­pa­tion. And final­ly, it’s emo­tion trans­ferred from words on paper (or, in my case, on Kin­dle) to the read­er.